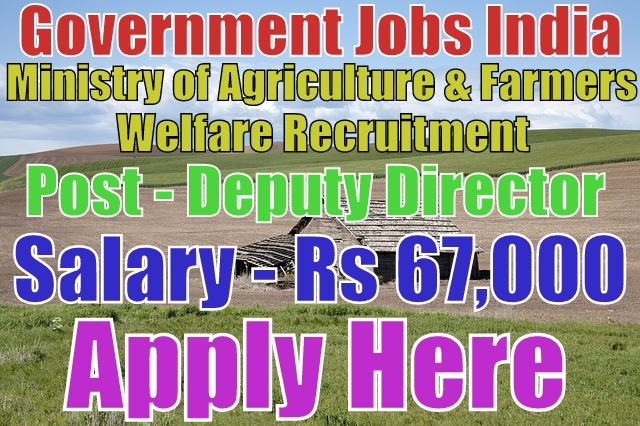 Ministry of Agriculture and Farmers Welfare has published recruitment notification 2017 for 37 deputy director and plant protection adviser posts. All legible and interested candidates have to apply on or before (27-04-2017). Further more information about salary details, educational qualifications, application fee and more information about given post is mentioned in detailed below. 6. Deputy Director (Weed Science) - 03. For agriculture recruitment 2017, candidate age should be less than 56 years. To know more about age details as post wise, click on detailed advertisement. To apply for the mentioned posts, candidate should must have done 10th,12th, bachelor's degree, doctorate degree in chemistry, M.Sc in chemistry / entomology / plant pathology or its equivalent/ relevant / higher qualification from a recognized board or university. 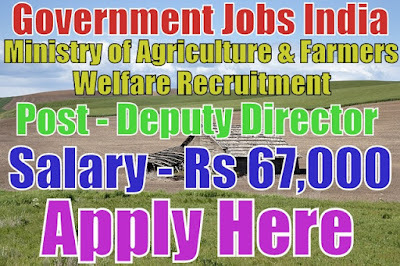 All legible and interested candidates can download application form from official website http://www.agricoop.nic.in or from detailed advertisement. After downloading and filling the application form, candidates have to send the application form along with relevant/needed testimonials (which is fully mentioned in detailed advertisement) super scribes "Application for the 'Name of Post' " to the given address. Shri M.K. Sahay, Under Secretary (PP.1), Room no. 039, Krishi Bhawan, New Delhi - 110001. A candidate should must apply for the posts on or before (27-04-2017). Application forms received after due date will not be entertained under any circumstances.